Arguably one of the greatest rock and roll albums of all time – and the key flowering of the partnership between David Bowie and Mick Ronson! The guitars here are heavy – so much so that the record's always crossed over big with crowds who are always suspicious of Bowie's artier work of the 70s – and represented a crucial moment when his groundbreaking music also found a large mainstream audience as well. 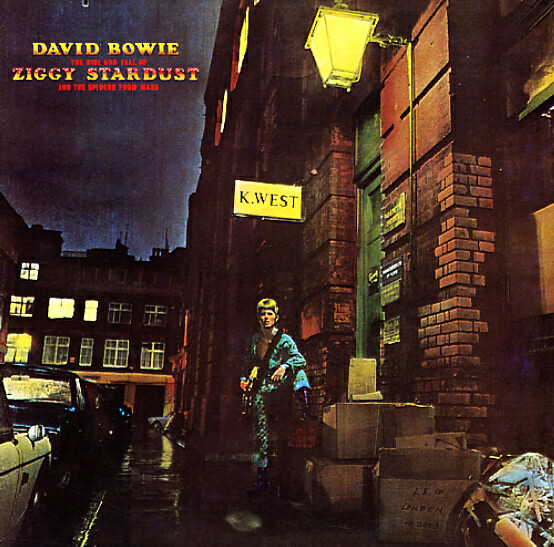 And despite the fact that Ziggy's an androgynous space rocker with a spurious pedigree, the manufactured posturing of the album's come to be taken quite literally over the years – a vivid text of alienation, expression, and redemption – served up beautifully over a host of classic tracks that include "Five Years", "Soul Love", "Moonage Daydream", "Suffragette City", and "Ziggy Stardust" – all further proof of Bowie's 70s ability to slide in wherever he wanted with ease! © 1996-2019, Dusty Groove, Inc.